A NEW YORK TIMES BESTSELLERThis September, DC Entertainment is making history by launching 52 #1 DC Comics issues starring the World’s Greatest Super-Heroes. To commemorate this milestone occasion, DC Entertainment will be releasing DC COMICS: THE NEW 52, a massive hardcover collection that collects every single one of these debut issues. Hitting stores just in time for th A NEW YORK TIMES BESTSELLERThis September, DC Entertainment is making history by launching 52 #1 DC Comics issues starring the World’s Greatest Super-Heroes. To commemorate this milestone occasion, DC Entertainment will be releasing DC COMICS: THE NEW 52, a massive hardcover collection that collects every single one of these debut issues. 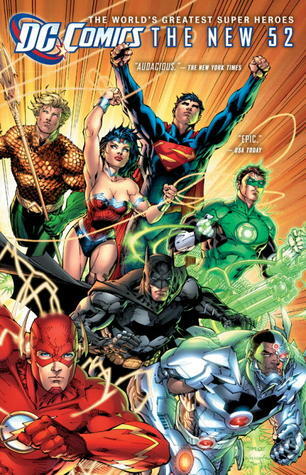 Hitting stores just in time for the holiday season, this 1,216-page compilation will include such issues as: JUSTICE LEAGUE #1 by Geoff Johns and Jim Lee ACTION COMICS #1 by Grant Morrison and Rags Morales BATMAN #1 by Scott Snyder and Greg Capullo GREEN LANTERN #1 by Geoff Johns and Doug Mahnke SWAMP THING #1 by Scott Snyder and Yanick Paquette STORMWATCH #1 by Paul Cornell and Miguel Sepulveda TEEN TITANS #1 by Scott Lobdell and Brett Booth And 45 more!